The heart of the studio is a Yamaha DM2000 digital console, connected through Digidesign 192 interfaces with a Mac with Pro Tools software. Genelec active sound monitoring system is in use (2 fields for 2-channel stereo listening and 5.1 system). Among the peripheral devices are Millennia HV-3C microphone preamplifier, Radial JDV Class-A DI-box and Line 6 POD XT Pro Processor. A set of professional audio plug-ins is provided to Pro Tools by t.c. electronic Power Core audio processor. Mastering is possible through the use of t.c. electronic System 6000 MKII processor. 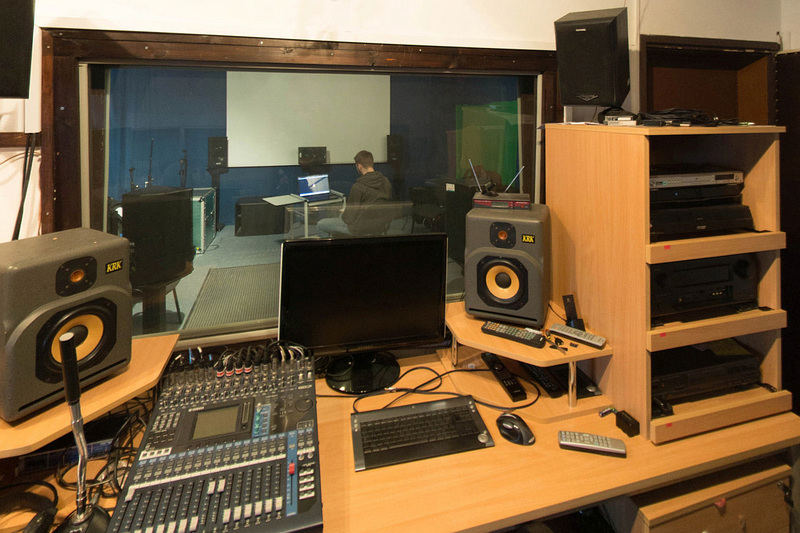 The studio is equipped with dynamic vocal microphones (eg. Shure SM58, Shure Beta 58A) and instrumental ones (eg. Shure SM57, i5 Audix, AKG D112) and condenser microphones (eg. Neumann TLM 103, AKG C 4000 B, Audix ADX51). Audix DP Elite 8 microphone drum set and Audix SCX25A piano set are also available. Thanks to the kindness of musicians co-operating with the Department, top class instruments (guitars and drums) and vacuum tube amplifiers (Marshall JCM800 and MG Blues 15) are available to students during the laboratory classes. The equipment in the control room can record audio created in the Kowalski auditorium or in live room located behind the auditorium. 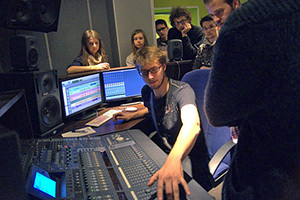 Laboratory classes are conducted in the studio as well as the works of the Audio and Video Engineering Interest Group. 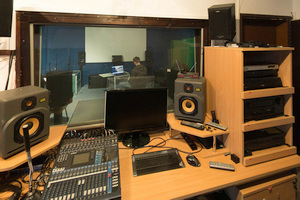 A set of rooms equipped for the tasks related to multi-channel audio recording and processing, and movie post-production. The Yamaha 01V96 console, connected to the computer through ADAT, is used for multi-track audio recording and playback. The room is equipped with a 7.1 Nexo active speaker system and a Full HD video projector, allowing for creation of movie soundtracks, post-sychronization of dialogues and creation of multi-channel sound spaces. The laboratory may also be used as a foley studio, for creating sound effect, employing the creativity of a sound engineer. The room is adapted for video recordings using the green box. It is equipped with a motion capture system by OptiTrack, consisting of 8 cameras used for recording of the actor’s movement, using 30 to 40 markers placed on the actor’s body and 3 more on a prop. The software allows for recording of the markers with a speed of 100 frames per second, live view, pre-processing and video export to popular file formats, such as BVH. The laboratory is also equipped with a mobile video recording system DataVideo MS800B. 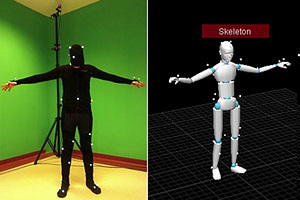 The recordings are used for creation of short animated movies and for analysis of a human movement. The DataVideo MS1000A mobile recording studio is used for the production and transmission of audio and video recordings. A maximum of 5 high resolution cameras may be connected to the system through the HD-SDI digital interface. 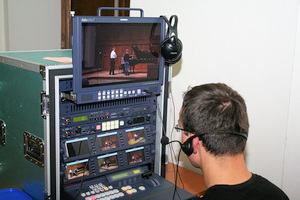 The system allows for video multiplexing and editing in real time, and for recording the video on a hard drive. The produced video may be transmitted to the Internet, e.g. to YouTube. The cameras that are used for recordings include Canon XH-G1 (3 cameras) and Panasonic AG-HMC151E (3 cameras). 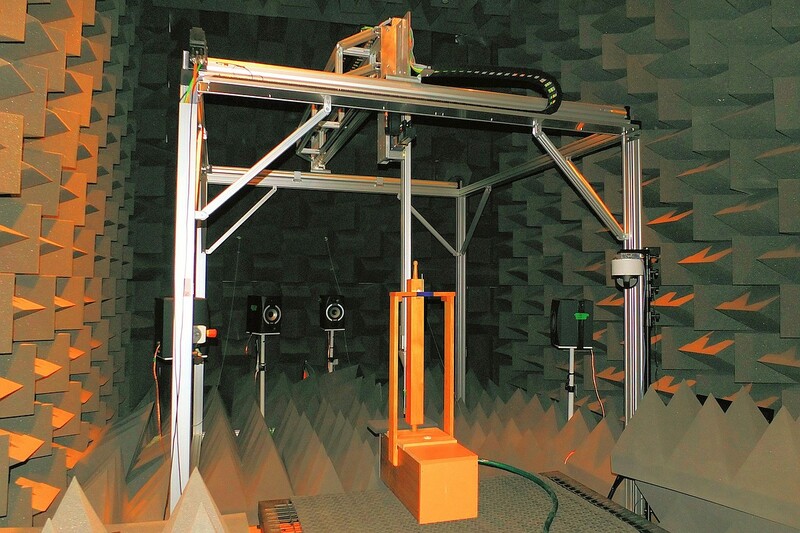 The anechoic chamber is a room with all surfaces covered with materials that dampen and disperse acoustic waves, resulting in a very short reverberation time. Therefore, only the direct sound waves, emitted by a sound source, are observed, without interferences from the reflected waves. The room is also equipped with a ventilation and heating system. It allows for performing a wide range of experiments related to sound emission and propagation. The anechoic room is used for experiments on the directionality of acoustic energy propagated from various sound sources, including musical instruments. Also, research on sound diffusion by obstacles, such as measurement of the acoustic field around a person’s head, is conducted. A specialized equipment is used to perform the experiments, including a computerized system for positioning the audio sensors in the room, a multi-channel measurement system, a set of professional microphones (transducers), wide-range sensors for sound intensity measurements, a turntable for measuring the directivity of speakers and microphones, an eight-channel loudspeaker system with a sound emission source, and the equipment for hearing tests, both in free-field and with headphones. The room is also used for teaching purposes. The laboratory classes include the environmental acoustics (measurement of noise sources, free-field noise propagation, acoustic power measurements), sound perception (hearing audiometry, free-field speech audiometry), electroacoustics (measurement of speakers, microphones and sound diffusors) and student projects. 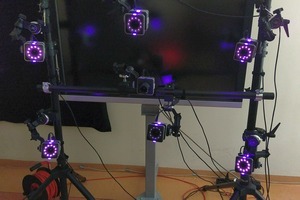 The laboratory is equipped with professional hardware and software for facial motion capture. 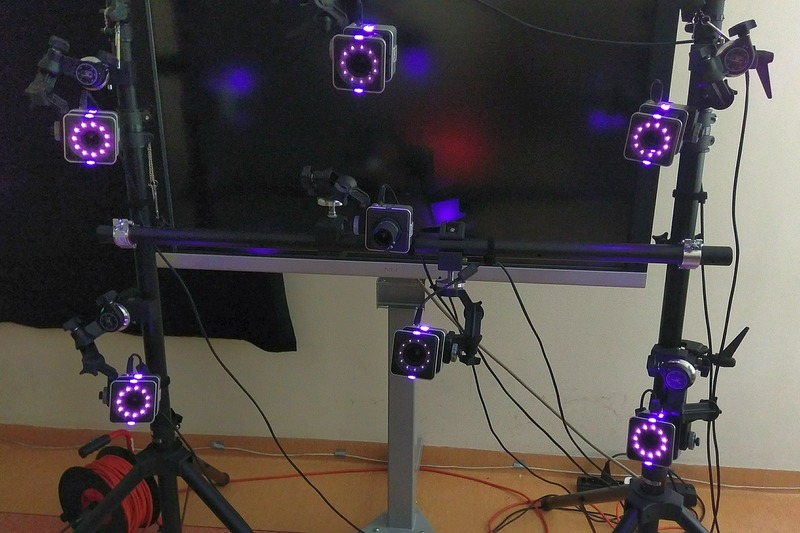 The system is composed from six Vicon Vero cameras with infrared LED light emitters, capable of recording movement of markers in 2K resolution with frame rate up to 240 frames per second, and one Vicon Vue reference camera, recording video in 2K resolution with frame rate up to 120 fps. Markers are attached to the model's face and their position is recorded in 2D by the cameras. The Vicon Blade software is used for reconstruction of marker positions in 3D, calculating trajectories of markers movement, marker labelling, translating markers movement onto a model, etc. The system is used in research for examining changes in speakers' lips shape when uttering specified phonetic elements. It is also used for educational purposes, including students' thesis preparation. The stand is equipped with an eight-channel APx585 measurement system by Audio Precision. 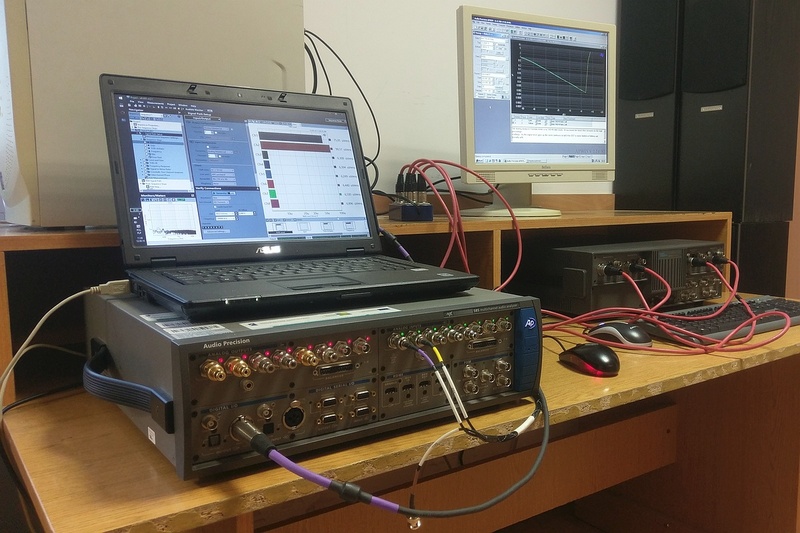 It is used for measuring parameters of analog and digital audio devices, including sound cards, audio interfaces, sound processors and various devices constructed by students. A secondary, two-channel measurement device, SystemTWO by Audio Precision, is used for the measurements of basic parameters in analog audio devices. Both devices are also used for teaching the topics related to studio measurements. Additionally, a specialized measurement system PULSE from Brüel & Kjær is used for measurements of the acoustic field, microphones and speakers, mainly in the anechoic chamber described above. The system may be used thanks to co-operation with the Audio Acoustic Laboratory. 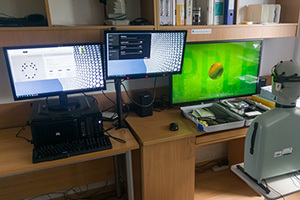 The main component of the system is a PC with a powerful graphic card, to which three monitors are connected. One of the monitors is an autostereoscopic 3D system by Dimenco, allowing for presentation of 3D video in Full HD resolution and 2D video in 4K resolution. One of the remaining two monitors is mounted on a boom and it is equipped with the Tobii EyeX gaze tracker. The setup includes also the Emotiv EPOC EEG helmet, Emotiv Insight, a helmet with the Starstim stimulator, a professional EEG helmet Neuron-Spectrum-4/P, the Echodia Elios device for the ABR examination, the aroma emission interface developed in the Department, and multimedia speakers. The setup is used for testing the multimodal interfaces for the diagnosis and stimulation of patients with brain damage, for recording and analysis of the ABR, EEG signals, and for oculographic studies (gaze tracking). The multimodal interfaces are expected to be a more effective and accessible approach to the diagnosis and rehabilitation of patients that are unable to communicate with others, especially the patients in coma and children with autism. 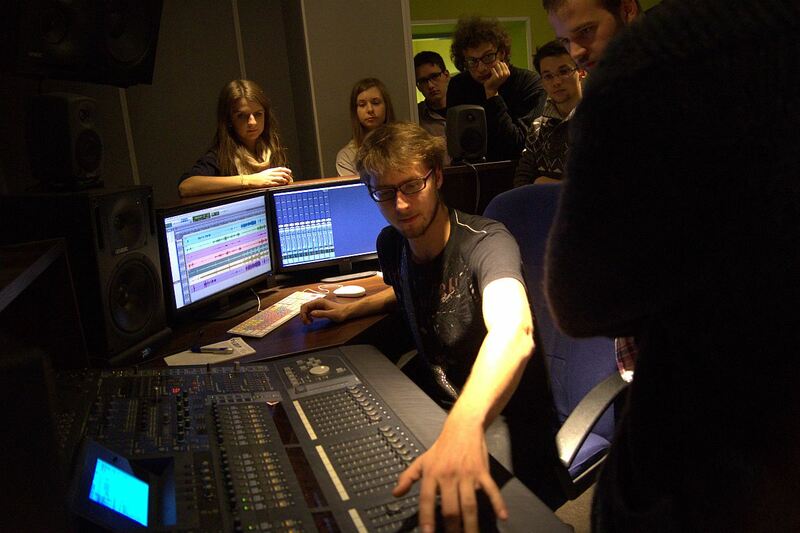 The laboratory allows the Sound and Vision Engineering students to gain a practical knowledge on the topics related to audio and video mastering. Each of the eight setups is separated from the others, allowing for an interference-free work, especially during the sound mastering. 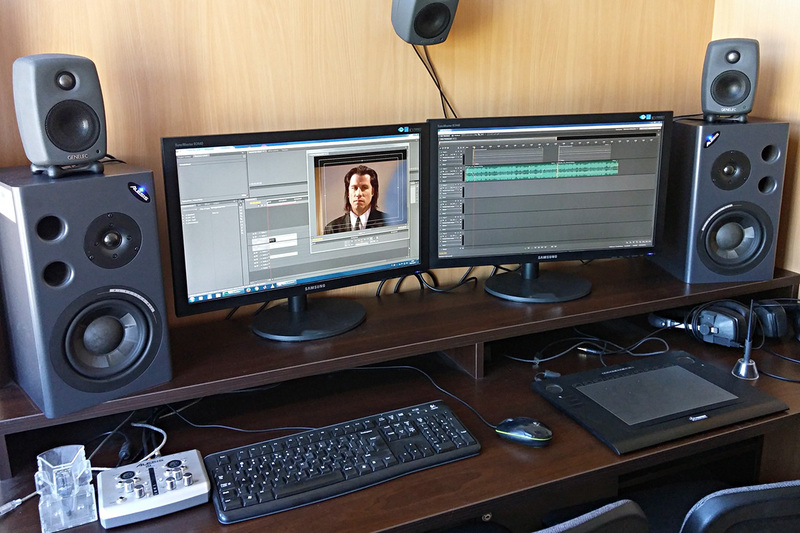 Each setup includes a PC with a set of software for audio and video processing (Adobe software package, Wavelab, Matlab, etc. 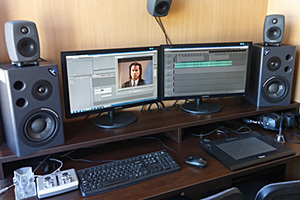 ), two 24-inch LCD monitors, Wacom A5 graphic tablet, a 5.1 loudspeaker system (Genelec 6010a, with a Genelec 5040a subwoofer) and the Panasonic AG-HMC81E video camera with a wireless microphone by Sennheiser.